Federer is in our backyard and we’re excited! It’s Brisbane International time and Roger Federer is in our backyard – only a few minutes drive from Boucher – and we can’t help but to be excited. One of the reasons this gets us feeling bubbly is because we’re all geared up for the tennis this year. We’ve created a special set menu and we’re open every day for lunch and dinner during the tournament. Our aim is to offer tennis players, support teams and fans another dining option where they can escape the tennis crowds for a truly enjoyable, high quality meal just one suburb away from the Pat Rafter Arena. Being an indoor, air-conditioned restaurant we can guarantee a comfortable dining experience regardless of what Brisbane’s weather is throwing at us. We’re keen to welcome everyone, but deep down we know our team is secretly hoping for some Grand Slam champs to walk through our door! The second reason we get excited about Roger being in town is because this man always has the nicest things to say about Brisbane, both the city and its people. Every year that he shows up he seems to genuinely be happy to be here. We know that he works hard while he’s here, but we get the feeling that the relaxed nature of our beautiful city provides a little respite from his crazy, busy tournament life. And not only that, he gives full credit to Brisbane International for its fierce competition and the importance it holds for the professional tennis community. “People like to talk about this tournament as a preparation for bigger things, but I don’t really see it that way,” Federer said. “Every tournament I play is important to me. Playing in Pat Rafter Arena with the crowds here in Australia, it’s always very exciting for me. This is a tournament I want to win. The draws are tough here … I told them they make it hard for me to defend my title.” Read more from the Brisbane International. So welcome back, Roger, and indeed to all of our valued tennis visitors. Fingers crossed we’ll be serving up our grand-slam menu to you very soon! Get all of the details and directions to Boucher here. 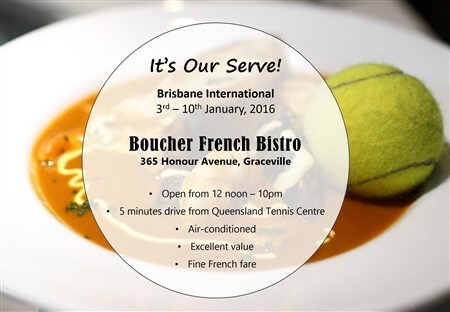 The Brisbane International is one of the most exciting events on Boucher’s yearly planner. This coming year sees seven Grand Slam tennis champs take to the courts at the Queensland Tennis Centre, Tennyson. Boucher is so close we’re almost on the baseline, and this year we’re hoping to hear a bit of John McEnroe angst when he takes on another favourite legend, Pat Cash. Yes folks, they’ll both be in town, along with our heroes, Roger Federer, Maria Sharapova, Victoria Azarenka and Queensland’s very own court superstars – Sam Stosur and Bernard Tomic. We know that tennis enthusiasts love bagels, bisque and breadsticks, which of course, is right up our alley. But as number one seed we also know we can serve up better than that! Our Chef, Peter Carter, has thrown the ball high and is ready to deliver a special Brisbane International Menu for our VIP players, their support teams, families and of course, all of the avid tennis fans. If you’re one of those lucky tennis fans, be sure to escape the heat and the crowds in between matches. Open for lunch from 12 noon and right through to closing after dinner, Boucher invites you to relax in air-conditioned comfort and enjoy some of the finest French food that Brisbane has to offer! View our Brisbane International Flyer & Menu here. If you received our Email Newsletter, make sure you quote the secret code to receive your $20 Gift Voucher. Please note that there is a minimum spend of $200 to use the voucher and this promotion is valid from 3rd – 10th January, 2016.